What if you took Hemingway’s worst book, handed it to William Faulkner, and asked him to rewrite the thing? Ever wonder how that might turn out? Well, wonder no more. It actually happened. We continue our cinema-themed posts by looking at To Have and To Have Not, which Hemingway called “a bunch of junk” and his very worst book. Even so, the worst of Hemingway was still apparently good enough for Hollywood to come calling- which is what they did in 1944 when they hired none other than William Faulkner to work on the screenplay. Let me say at the outset that I did not enjoy this book very much. And it kills me to say that because I absolutely loved parts of it. The Harry Morgan sections, written in the first person are, in my humble opinion, some of the best Hemingway excerpts out there. The fishing trip with the numbskull tourist, the contraband smuggling, and the tense action on Cuba are all fantastic- there’s no use even debating it. And in the ill-fated re-taking of his boat from Key West bank robbers he gives us some gripping, "Snows-of-Kilimanjaro"-esque deathbed ruminations. Classic, classic stuff. But the meandering, third-person omniscient sections about random writers and wealthy yacht owners… what was that all about?! This book could have been so much cooler without all that crap. Focus, Hem! Enter Faulkner and co-screenwriter Jules Furthman. They made the prudent call to center the film on Harry Morgan, and they held to the early sections of the book very faithfully. Harry, his rummy companion Eddie, and the town-skipping tourist who stiffs his fishing guide to the tune of thousands of dollars, all gave me hope for the movie version. …And from there the adaptation kind of runs off the rails. Still a great movie, mind you, but not a great adaptation. Under political pressure from the Roosevelt Administration they moved the action from Cuba to Martinique. And maybe they were sidetracked by the casting of Humphrey Bogart, but with the subplot of an underground political figure who needed safe passage off the island, this thing turned into a cheap remake of Casablanca. That’s not an exaggeration, either. You’ve got the he hardscrabble anti-hero who doesn’t stick his neck out for anybody, but who ends up doing the right thing. The beautiful female lead, who may or may not end up with the hero. The whole thing playing out in a smoke-filled café, complete with a “Sam”-like piano player, under the constant menace of local authorities. 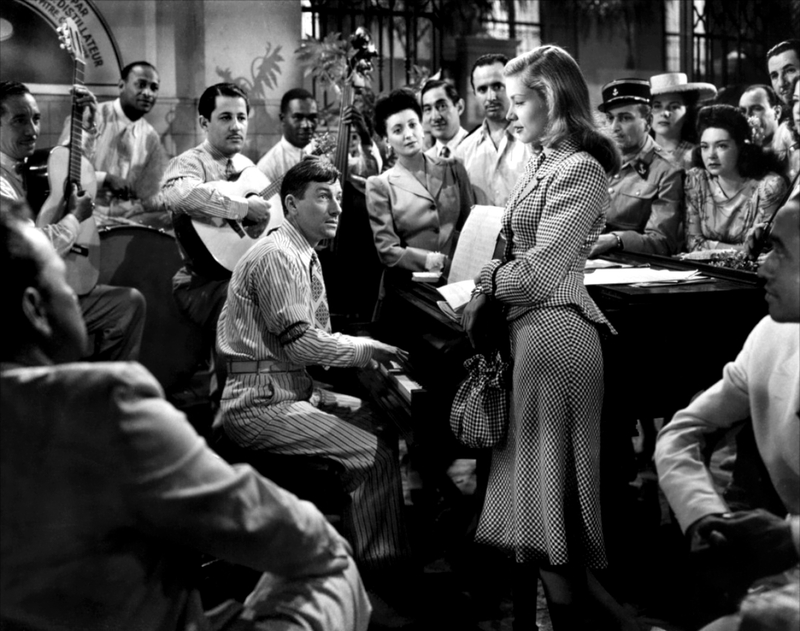 It’s Casablanca Part Dieux- only with Lauren Bacall, so, who am I to complain? The last line from that clip is ranked #34 on the AFI’s all-time top 100 movie quotes. And since Faulkner is credited with developing much of the drama that unfolds “upstairs,” it’s very likely that that line was his creation. Read it, watch it. You decide.